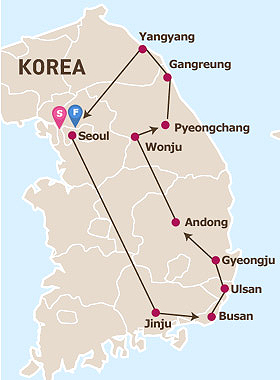 Tour South Korea in 6 Days, with a Seat-In-Coach Value Tour. Arrive into Incheon airport, transferring to Seoul accommodation. The next day travel to Jinju. Visit Jinjuseong Fortress, then head to Busan, the largest port in Korea. In Busan, visit Nurimaru APEC House, at Dongbaekseom, and the Centum City Shopping Mall which has the largest department store in the world! Next morning, depart for Ulsan, and visit Ulgi Park - a seaside park on the east coast. Continue to Gyeongju, visit the Bulguksa Temple, Gyeongju National Museum, Anapji Pond and Tumuli Park. The next day leave for Andong and visit Hahoe Village. Then on to Wonju, and the Hanji Theme Park. Experience the making of traditional Korean paper, then head for Pyeongchang, staying overnight. On day five, continue to Gangneung, and visit the Jumunjin Fish Market. Then on to Yangyang for a short hike to appreciate the scenery. After lunch, return to Seoul, arriving in the early evening. The final day is free at leisure until your departure. The first stop is Jinjuseong Fortress, historically linked to the Japanese invasion in 1592. Afterward, transfer to Busan and visit Igidae Park, the coastal walking path, famous for its panoramic view of Marine city and Gwangan Bridge. The rest of the day is free for you to explore Haeundae Beach. You may spend the evening exploring the cafes and pubs, as well as Haeundae Market. After dinner, check in to hotel and remainder of the day is free at leisure. After breakfast, head to Ulsan and pass through the world's largest single automobile plant. Visit Daewangam Park, littered with rocks carved into interesting shapes by the wind and ocean. Explore too Gyeongju National Museum and Daereungwon Tomb Complex. Before you head to Cheomseongdae Observatory, choose your preferred Hanbok, Korean National Costume and make a special memory wearing Hanbok with your companions. Lunch and dinner will be served en route at local restaurants. After hotel check in, the rest of the day is at leisure. After breakfast, transfer to from Gyeongju to Andong and visit Andong Hahoe village, home to descendants of the Ryu clan of Pungsan and well-known for its traditional houses. Then, transfer to Wonju and visit Hanji Theme Park where you can get a chance to experience the Hanji making process. Lunch and dinner will be served en route at local restaurants. After hotel check in, rest of the day is at leisure. After breakfast, this morning explore Jumunjin Seafood Market, including a variety of fresh seafood caught on the East Coast. For the next stop, transfer to Yangyang for a short hike of Mt. Seorak. After the hike, transfer to Seoul. N.B. If you are already in Korea, this tour can operate as a 4 Day Tour without Arrival and Departure Days, starting and ending in Seoul.